My parents, Jim and Donna Hendershot, had a rule when I was little, they wouldn’t let me fly until I could see over the basket. So being the shorty that I am, this amazing flight didn’t get to happen until I was five years old at a festival in Abingdon, VA. My dad put me in the basket, flew over to the next field and switched me out with another passenger. My mother had to deal with the heinous consequences of a VERY irate child for the rest of that chase. They knew from that point on that I was not going to make their job easy when it came to who would get to fly. I was hooked and I was going to get myself in that basket every chance I got! Twenty years later, finally done with college and settling into married life, I decided it was time for me to really focus on becoming a pilot. Spring 2013 came around and my dad and I began my training flights. It took a flight or two but when he FINALLY gave me full control of a landing and quit saying “ burn” every five seconds, I had my “a-ha” moment. It all started to click and from that moment on I really knew I could do it. After a good few months of training with my dad we figured it was time for some instruction from a non-family member. After a few training flights with Dan Stukas, it was time for my solo flight! The solo flight is such a surreal feeling. I was doing something so familiar yet foreign at same time. 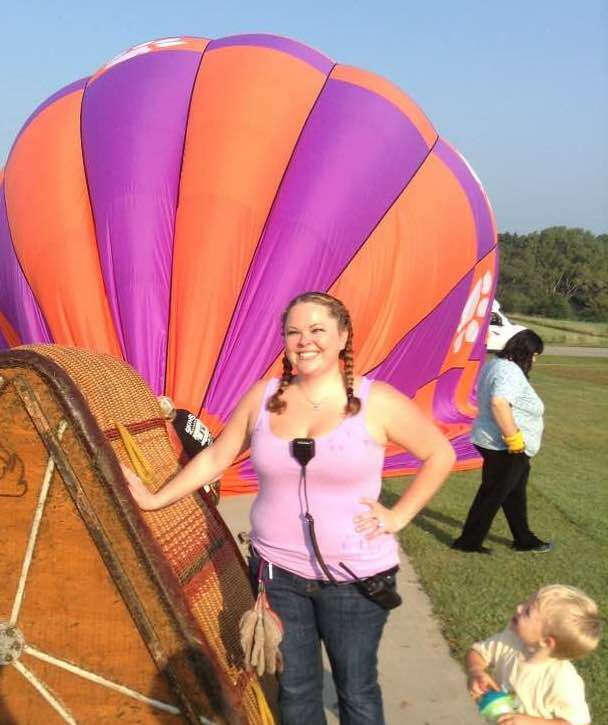 It was fun and a little scary, but finally two hours, and one hysterical mom later, I had a safe landing and a fun celebration with some ballooning family. After that day I was really feeling the addiction I see in other pilots. The winter slowed me down a little and I knew that my written was going to expire soon, but I did not want to rush myself. I knew I would be ready by spring so I made a decision to retake my written exam and take the check ride in April 2014. I decided to take my check ride in Tampa, Florida. I made the trip with my parents, Mark Powers, Jeff Simmons and my husband Brandon Nelson. Dan and Susan Stukas caught a flight from California to make it there for the big event. I spent every spare minute in the days leading up to it studying, which apparently paid off! The next challenge would be the check ride itself which would be the following morning. When we arrived I had no clue where we were or what this supposed “great launch field” looked like because of the crazy amount of thick fog that did not want to leave! Eventually, about an hour after sunrise, the fog was burning off enough that we began to set up the balloon. I looked around my basket at everyone there to support me and I felt really confident that I could do this. We launched with calm winds on the surface and about 5 to 6 knots a few hundred feet up. The flight itself was relatively short. We didn’t go far but the examiner felt confident he had seen what I could do. We had a lot of direction to play with so we ended up almost going back to where we launched. Aside from my nerves, it turned out to be a really fun flight! Afterward, we went back to the hotel where I was issued my private pilot’s license and everyone around me had a sigh of relief. It was an amazing day already and it was only 10am. I have been fortunate to have grown up in this sport around some really amazing and talented pilots and crew. I am especially grateful for my three primary instructors: Dan Stukas, Jimmy Hood and my dad Jim Hendershot. I am so thankful to be surrounded by great people in ballooning and I look forward to my next adventure!